Incredibly delicious Alter Eco Chocolates make great holiday hostess gifts and stocking stuffers. The colorful packaging is absolutely stunning, and a rainbow of stacked bars elegantly tied together with a simple ribbon are sure to bring a smile to a loved one’s face. Plucked from organic trees in the Peruvian Amazon and Ecuadorian Coast, Alter Eco’s cacao beans journey to the base of the Andes Mountains, where they are transformed into some of the world’s finest cocoa products. The final destination is Switzerland, where expert chocolatiers craft their unique and habit-forming bars. 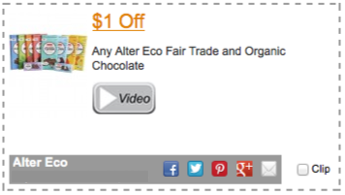 You can save $1 on Alter Eco chocolates using coupons you download and print from http://www.CommonKindness.com.